Gold breaks $1300 – a buying opportunity? I will be the first to admit a bad call – readers of this blog know that I noted last summer’s false “sell” Bear-o-meter reading– here. However, I do like to think that most of my observations are reasonably accurate. Remember, my view is not so much about hitting it outta the park, but in preserving capital. My call to avoid gold numerous times last summer was one of those good “save your capital” calls. Right now, my view on gold is neartermed bullish, long termed bearish. I believe that gold is probably setting up for a very, very short termed upside swing. Before getting too excited, note that gold remains trapped in the same base that it’s been stuck in since 2013. As I have noted in the above blogs, and other blogs in the past – gold cannot be considered a mid or long termed buy until it definitively breaks the $1360-ish wall. The chart below illustrates that this massive resistance point was tested and failed earlier this year and in the middle of 2017. As it had numerous times since 2013. My neartermed call for gold to rally is based on its test of the ascending trendline support – per the chart above. Gold is also seeing its neartermed (daily) stochastics moving below its “oversold” line – meanwhile RSI is nearing that level. Meanwhile, the longer-looking MACD indicator is dead flat, implying no real lasting momentum. 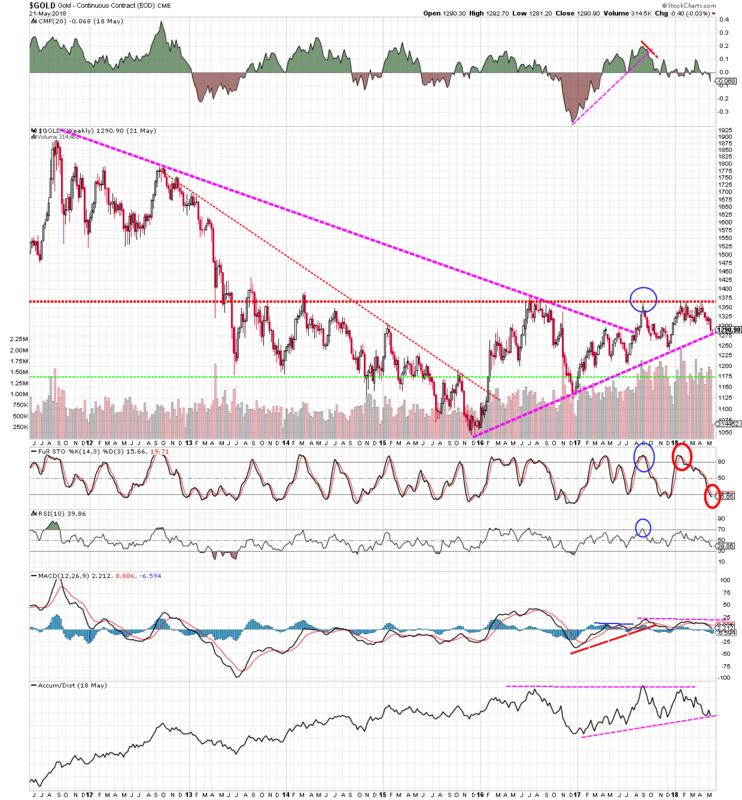 Should gold move down a few more bucks, we might see RSI slip into its oversold level – after which neartermed traders might keep an eye out for a hookup on both it and the stochasitics indicator. Moneyflow (bottom pane) is flat, as is the Chalkin Moneyflow oscillator (top pane). This suggests that any move to the upside, if it happens, will be temporary. Readers might know that I like using Sentimentrader’s various indicators to get a feel for irrationality in enthusiasm or pessimism. Their gold “optix” – as seen above- is a compilation of the various sentiment indicators they track (Market Vane, Consensus Inc, Bloomberg, etc). The gold optix is approaching, but not yet at the “overly pessimistic” green (buy) zone – represented by the lower horizontal dashed line. It’s my thought that if gold extends its losses a bit further, both the momentum indicators noted above AND the Sentimentrader optix may trigger a buy signal. This may line up closely to the mid-summer, which is the traditional seasonal buy point for the metal. Keep an eye on gold for a short termed trading opportunity based on the indicators discussed above. It might happen in the coming weeks. Such trades aren’t for everyone, but for those with a quick trigger finger, we might see gold get back to its $1360 ceiling before the summer ends.